When I am out out training I try and be a sensible road user and share the road with other users.This means to me singling out on small roads when cars come up from behind. The problem with this is you have to listen for them and keep looking back. Well I was riding with young Peter and was amazed by his sense of hearing as he kept informing me “Car back”, or “Car behind”, when I had not heard them. This went on for about half an hour and by the end I was thinking I need a hearing test because I could not hear the vehicles. So I made comment about his hearing. He then informed me his rear Garmin light was also a radar which notified him of cars approaching, their speed and position. It also causes the light to flash brighter and more vigorously. 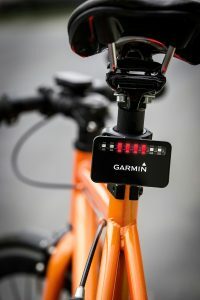 So impressed I bought a Garmin Varia Rear View Radar. It needs a Garmin Edge model to work with but very simple to set up and use. Having now used it, I beleive it helps riders manage their safety, plus will make manage riding in pairs or in a group easier. As well as seeing approaching vehicles you can also use it to help you pull across the carriageway. Thoroughly recommend it to help you stay safe out there.